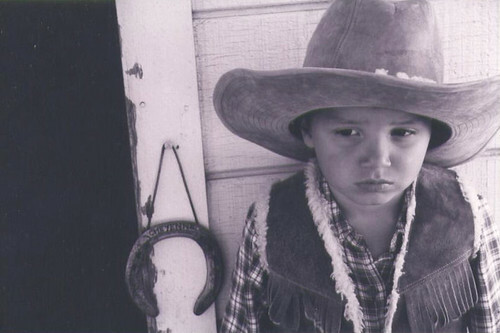 Hannah from Blair’s Boys had the most endearing post about her sons’ quirks, and her little one loves to dress up like a cowboy. 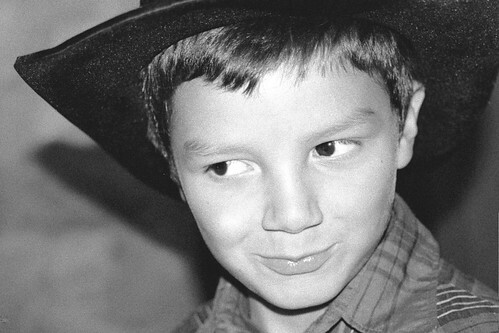 It made me remember when my 9 year old was little, and he spent 100 degree Temecula summers dressed up like a cowboy, with a suede and shearling vest over his flannel shirt no less! I found these photos, and they made me smile. He is six in the first one, and we had visited the Temecula museum, which has a dress up area for kids. In the second one he was three. This was his outfit almost every day that summer. I miss those days! ~ by bekaboo on February 6, 2008. Awwww, how CUTE! Tyler would love one of those vests! Thanks so much for sharing your photos, and taking a trip down memory lane. I enjoyed reading about it. I love these photos! What a cutie patootie he was and still is!